Click any of the U.S. Coin Types listed below. Everything from the Half Cent to Double Eagle is covered. Once a selection is made, you'll zoom off to a dedicated page where you'll read about the coin's provenance and historical legacy, complemented by beautiful photos and images from long ago. Each coin type chapter has a key date summary and recommendations. What is meant by "key date" coin? Here is one definition: It is a coin of relative scarcity popularly sought by coin collectors. There is limited supply to meet demand, driving prices higher over time, compared to its more common counterparts. Let’s dig into this a little deeper. If a collector seeks to acquire coins destined to rise substantially in value over time, there are really just a few coins worthy of consideration. It’s easy to find an online U.S. coin auction where thousands of old coins are for sale at any moment, but only a tiny handful of them are likely to reward their owners with strong price advancements in the years ahead, based on numismatic integrity. Before we get too carried away with our discussion of key dates and rising prices, let's get the links to the various U.S. coin types pages out on the table first. Click any of these links directly below to view specific coin type pages. If you're ready to resume our discussion about key dates, scroll down a bit or click here. Types marked with an asterisk (*) indicates that we also have in depth Coin Value Tables posted elsewhere on this site for your viewing. There is no charge to access the data tables. The tables track U.S. coin prices over long time periods and are a useful tool for collectors seeking to identify coins possessing good potential for solid future growth, based on past performance, while avoiding those with questionable expectations. In other words, the tables help identify... you guessed it... key date coins. Now, there’s nothing wrong with assembling a collection while ignoring potential financial returns; in fact, it can be argued this approach embodies the pure essence of the coin hobby. However, numismatic ambitions can be fulfilled while simultaneously buying coins almost certain to increase sharply in value. The question is, then, how does a buyer sort through thousands of offerings to isolate promising key date coins for the purpose of reselling someday at a much higher price? Coins that have been the most eagerly pursued by the collector base for decades are the same coins that will remain hot in the future. The underlying cause for their popularity is genuine scarcity, relative to other coins in a given series (e.g. 1909-S VDB Lincoln cent). “Key Dates” is numismatic jargon for these favored coins, and because of the Supply/Demand law, are characterized by the steepest price inclines, when charted against their more common counterparts. 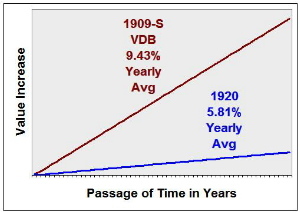 Dark red line illustrates value increase pattern of the Key Date 1909-S VDB Lincoln cent in Good condition, over a period of 50+ years. The blue line represents value increase of the common date 1920 cent in Good condition over same period of time. The graph does not depict dollar values of the two coins; it is intended to show the dramatic effect of differing growth rates over time. Because the 1909-S VDB has a proven track record of performance, buyers of this coin can expect it to easily outpace its common date contemporaries. As each U.S. coin type is introduced and described in this section, key dates will be listed, along with some long term value trend data as evidence. We believe that if collectors strive to purchase properly graded key date coins, they will attain two lofty objectives: (1) proudly own a numismatic legacy of high regard, and (2) realize much higher prices down the road, should the decision someday be made to sell. When you acquire Key Date rare coins, you have every reason to expect them to rise in value, higher and higher the longer you keep them. On occasion, there may be minor, temporary reversals, followed by a lonp period of consistent growth. The biggest risk when you buy coins on eBay, or anywhere else, is with the honesty of the people selling them. We have a full section on coin buying advice to help you avoid frequent pitfalls. On many occasions throughout the US Coin Values Advisor website, numismatics is paralleled with story of America. The study of coins is a lot more than just dates and mint marks; an appreciation of the historical underpinnings of the nation that issued them brings a much broader picture into perspective. Nearly every page in the "U.S. Coin Types" section explores some historical connection. 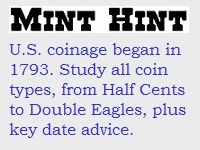 In that light, we have a section devoted to the joint nature of coins and US history. The image above is typical of the lessons you'll find on US Coin Values Advisor. 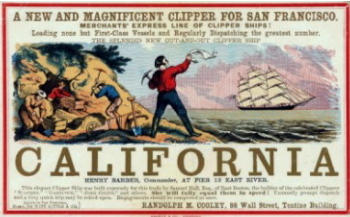 It is an advertisement meant for gold seekers wanting to get to California from the US east coat by way of boat. Following the discovery of gold, many thousands of "49ers" headed west, soon leading to California statehood and a branch mint for San Francisco. Public domain image. When it comes to buying rare, valuable coins, a good rule to follow is to buy only coins that have been certified by a highly reputable coin grading service, or from a seller of unchallenged stature (preferably both). Sadly, there are some unscrupulous operators who cheat innocent buyers by overstating the grade of coins they sell. This happens all too often on eBay US coin auctions and elsewhere. To help pull off this fraud, they align themselves with some official sounding grading service that purposely inflates grades. For example, a victim may end up paying an MS-65 price for an MS-60 coin. Two of the oldest and most reputable coin grading companies are PCGS and NGC. Coin collectors feel more secure when buying coins under the PCGS and NGC label. Even here you have to be careful; fraudsters are aware of this and have been known to counterfeit these labels! One of the advantages of buying from a long established coin dealer is that they know how to spot the fakes and protect themselves and their customers. There is also ANACS and ICG, both of which are highly regarded. There probably are other good grading services, but these are clearly four of the best. It is our hope at US Coin Values Advisor that you’ll spend some quality time perusing the many U.S. type coin pages, where you’ll discover (or broaden your understanding of) the rich heritage of United States coinage. We also hope you’ll take advantage of our researched recommendations and proudly acquire key date coins of high potency.